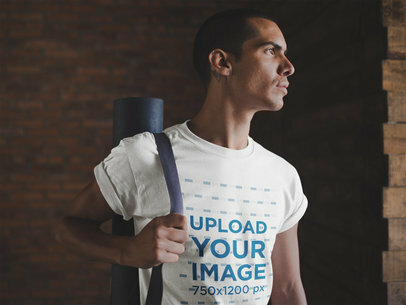 Use now this awesome mockup featuring a man wearing a tshirt after a yoga class, it's a great choice for you to promote your latest yoga t-shirt designs! Use the HEX tool on the right to choose a color for the tee, then drag-and-drop your design image file over the upload button on the left side of the page. Use Placeit's visuals and make your revenue grow with amazing visuals! Try another T-Shirt Mockup! Have a look at this awesome mockup featuring a man meditating in the lotus pose, he's sitting on a yoga mat while wearing a tshirt and joggings pants as well. Use the menu on the right to choose a color for his tee, and the upload button on the left to put your design on his garment. Simple, wasn't it? Use Placeit's visuals and make your revenue grow with awesome visuals! Try another T-Shirt Mockup! 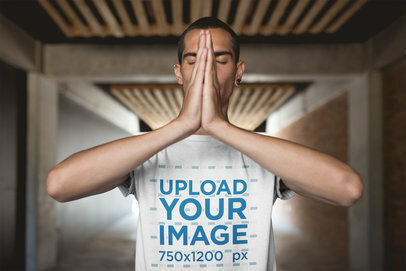 Use now this awesome mockup featuring a man focusing while wearing a t-shirt at the yoga class, it's a perfect choice for you to promote your latest tee design in a more photorealistic way! Use the menu on the right side of the page to choose a color for the tee, then drag-and-drop your design image file over the upload button on the left. Simple, right? Try another T-Shirt Mockup! 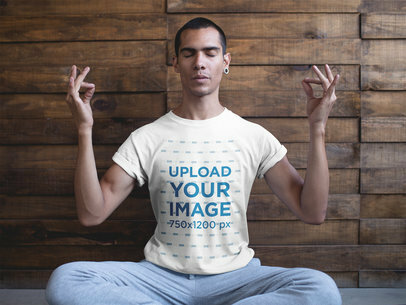 Use now this awesome mockup featuring a man doing an up-dog yoga posture while wearing a round neck t-shirt, it's an excellent visual asset that you can use to promote your latest designs for tees in a more photorealistic way! Use the HEX tool on the right, then drag-and-drop your design image file over the upload button on the left. Try another T-Shirt Mockup! 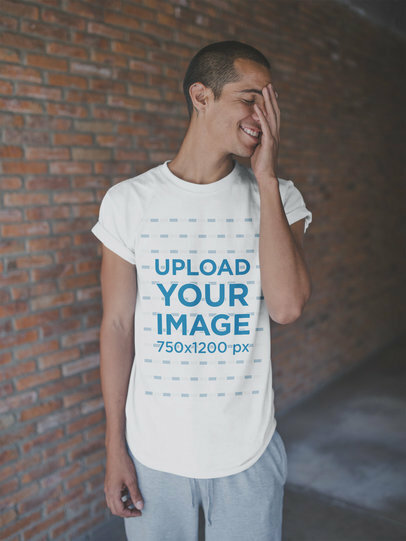 Use now this awesome mockup featuring a man wearing a t-shirt and doing a standing bow pulling pose, it's a beautiful visual asset that you can use if you want to promote your latest design in a better way! Use the HEX tool on the right to choose a color for his tee, then drag-and-drop your design image file over the upload button on the left. Try another T-Shirt Mockup! Take a look at this awesome mockup of a man standing on his arms while wearing a round neck t-shirt during a yoga class, this image is an excellent choice if you are looking for a way to promote your latest yoga tshirt design in a more visually appealing way! Use the menu on the left to upload your design image file to the tee, and the HEX tool on the right to choose a tee color. Try another T-Shirt Mockup! Use now this awesome mockup featuring a man stretching his legs for a yoga class while wearing a round neck tee and promote your latest designs for yoga tees in a more beautiful and photorealistic way! Use the HEX tool on the right to choose a color for the tee, then drag-and-drop your design image file over the upload button on the left. Try another T-Shirt Mockup! Use now this gorgeous visual asset featuring a man doing a side plank pose wearing a t-shirt on his yoga mat and market your latest t-shirt designs in a beautiful and photorealistic way! Use the menu on the right to choose a color for the tee, then drag-and-drop your design image file over the upload button on the left. Simple, right? Try another T-Shirt Mockup! 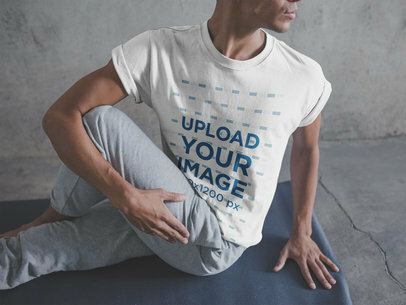 Use now this awesome mockup featuring a selfie of a man wearing a t-shirt while crouching after yoga classes, it's an excellent visual asset that you can use to promote your latest tshirt designs in a beautiful way! Use the HEX tool on the right to choose a color for the tee, then drag-and-drop your design image file over the upload button on the left. Simple, right? Try another T-Shirt Mockup! Have a look at this awesome mockup featuring a man wearing a t-shirt while doing a yoga pose, he's sitting in a concrete room. Use the menu on the right to choose a color for this man's t-shirt, and the upload button on the left to put your design on his tee. Simple, right? 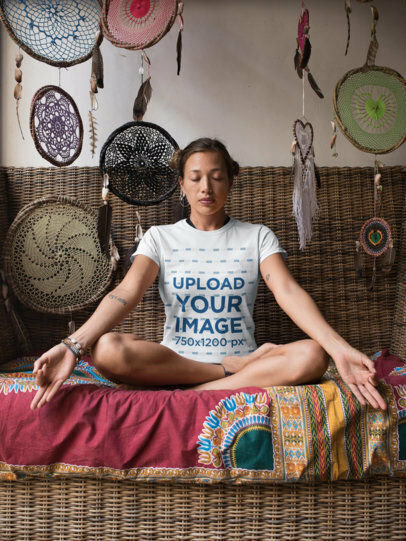 Use Placeit and make your revenue grow with awesome visuals for your latest yoga t-shirt designs! Try another T-Shirt Mockup! Take a look at this awesome template featuring a smiling dude wearing a t-shirt and leggings while after the yoga class, it's a gorgeous visual that you can use if you want to promote your design in a more realistic way! 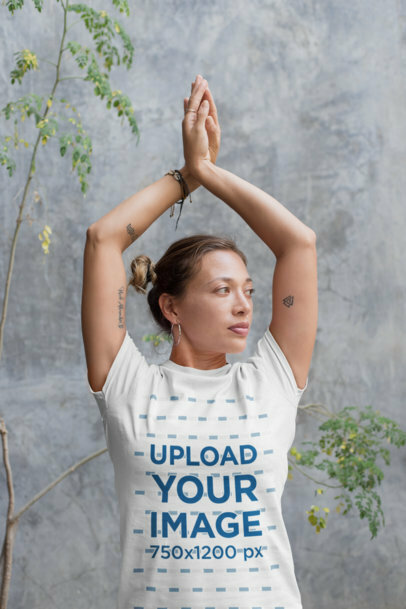 Use the HEX tool on the right and the upload button on the left to customize this image and start selling more yoga t-shirts! Try another T-Shirt Mockup! 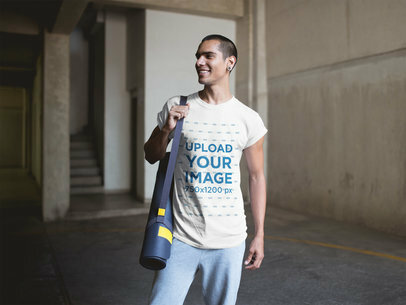 Have a look at this awesome mockup featuring a man wearing a t-shirt while carrying his yoga mat, it's a great visual asset that you can use if you are looking to promote your latest design in a better way. Use it now by choosing a color for the tee with the HEX tool on the right, then drag-and-drop your design image file over the upload button on the left. Try another T-Shirt Mockup! Customize this great hoodie mockup from Placeit by simply dragging and dropping an image featuring one of your designs onto the template and in no time get original visual content ready to be added to your visual marketing campaign right away! This mockup of a redhead girl doing a yoga pose while indoors is a great choice for you to promote your latest designs for custom fitness apparel. Start now! The upload button to the left will let you upload a design of your own, then edit this girl's custom athletic wear colors with the menu to the right. Wasn't that easy? Promote another design for Custom Workout Shirts! 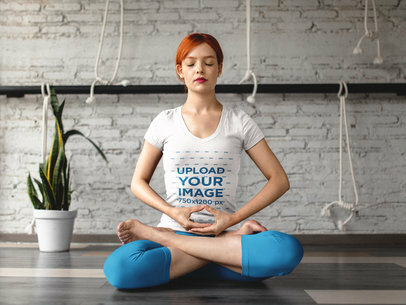 Look at this awesome fitness mockup featuring a girl doing a shavasana while wearing custom sportswear, you can now edit this image to promote your latest designs for custom athletic apparel in a great way! Use the menu on the right to choose her custom workout clothes' colors, then upload your design with the upload button to the left. 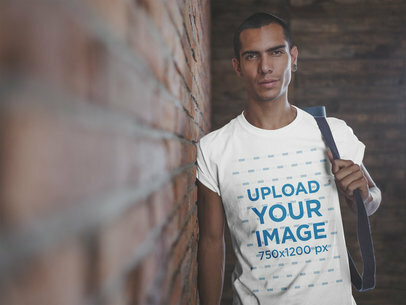 Use now Placeit's sports t-shirt mockups. Try promoting your design with another Custom Fitness Apparel mockup!